Bunnicula author James Howe has written a very short chapter book about a girl named Rex whose parents adopt a baby boy named Matthew. 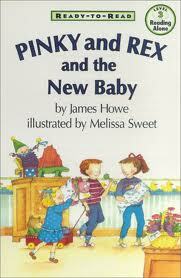 Her best friend, a boy named Pinky, initially encourages the anxious Rex: babies are OK, you can handle it. Rex quite likes being a big sister, and becomes less available to Pinky. He is bothered by this. As Rex becomes more used to her new role, she is able to step away from the baby and play more with Pinky. The third chapter of the book addresses adoption. Pinky and his sister ask their parents whether they were adopted. The answer, and the book’s explanation of adoption, is: you’re not adopted, but Rex’s parents wanted a second child, and for reasons no one knows, they couldn’t have one. So they adopted Matthew. The children ask who gave birth to Matthew, and the answer is that his birth mother was “a young woman who loves him but couldn’t take care of him.” Pinky’s parents acknowledge that they’re not sure why she couldn’t care for him, but they are sure that she “loved him so much that she was willing to let other people become his parents.” I wish there was more information on her. There are a few good messages in this book. The book shows that older siblings don’t need to be parentified to be special, that children will feel different ways at different times about their new siblings, and that life does return to normal even after big changes. For those reasons, this book could be helpful to a new (or soon-to-be) big brother or sister, as well as to a friend of a child whose family adopts a new child. Buy it / borrow it / skip it? Borrow it. Are there many books about families that adopt after having a biological child? I feel like most of what I've seen are books where all the children are adopted. You're right - most are "all adopted," and many talk about parental infertility as part of the reason for adoption. The one book I've reviewed so far that does show a family of four getting ready to add an adopted sibling (from a different culture & with a different native language) is Tomie DePaola's "A New Barker in the House." It's definitely worth checking out. Some books don't say one way or the other whether the child had kids before the adoption; books like that, you can read your own story into: Todd Parr's "The Family Book" and "We Belong Together," and John McCutcheon's "Happy Adoption Day."